Pastor Jerry Grant is based in Tucson, Arizona. He is a Canadian who had moved there 5 years before from Calgary (or was it 2 years before as we are also told? ), where he had pastored for 10 years. He had been married for 30 years but still feels that he has “a stunning spouse" with whom he had two children, now aged 23 and 21, who had both become church related missionaries working in far-off and dangerous places. He is an athlete, a biker and a hiker who enjoys skiing and can even fly a two engine prop plane. He “had striven to be as perfect a man and husband as possible .... He made an effort toward pleasantry in every situation, a manner to instill and invite confidence both in his church membership and in the other relationships of life. Those who spoke to him knew he was listening with his heart." So he “had evolved into a reputed confidante and father confessor among his flock and within his community. Jerry Grant loved human beings, all the more so in their times of trial but no less in their times of joy." Brian R Dill (1940 - 2005) was a dual citizen of Canada and the USA. After achieving a Masters degree in theology he served as parish pastor in both countries. He lived in Tucson. Apart from that he tells us next to nothing about himself, except that “this novel was written over a period of 10 years, under the trials of pain"' He goes on to explain that he was also writing an autobiography about his struggle with pain. Unfortunately he seems to have died a few days after Clerical Error was published in January 2005, and his autobiography never appeared. I would welcome more infomation about him, also his photograph. If you can help, please get in touch with me via my Guestbook. Clerical Error tells the story of Pastor Jerry Grant, recent Canadian immigrant, who is wrongly accused of tax fraud. Ruthless CIA agent Blackwell offers to write it off as a clerical error if Gerry will use his influence with Rick, an important Canadian government official to determine if Canadian waterways are guarded. His wife, Jennifer, is held as collateral. Gerry's friend is then brutally murdered and Jerry struggles in a desperate attempt to reach Canada's Prime Minister with his amazing discovery that American troops, armed with “what seemed like tactical nuclear underground bombs", are about to invade Canada to grab supplies of much-needed fresh water! It is a totally absurd plot, with absurdity heaped on absurdity. The author explains that his aim was to shock people into realising the "terrifying truth: little drinkable water remains, especially in Southern Arizona.“ But as the plot unfolds, things become so ludicrous that no one could possibly take any of it at all seriously. It seem a pity that the author could not have drawn on his own experiences, including all those years of pain, to produce a more realistic story which might have moved as well as entertained us, and enable us to overlook his rather stilted style, as when he writes: “Now it came to mind, Jerry's that is, rather than hearing of Rick's political exploits out here it would be far superior to get into detail back at the mansion where there were, as Blackwell inferred, listening devices." Then, when his friend Rick's face was torn apart by a bullet, we are told that Jerry “embraced the lifeless body and cried buckets of despair and grief. This was horrific. Richard Green had been shot. He was dead - and he was dead beyond a doubt. Body parts had been blown away." There are various typos and inconsistencies too, and the author is in the habit of underlining words, as when he writes “Jerry told it all", a use only found in self published works. And you can't really believe how the central character, Jerry, was transformed “from a genteel, kindly man to a vindictive, vengeful character ready to kill". He even “belted Blackwell (the villainous CIA man who amazingly keeps on reappearing) squarely in the kisser", saying, "That's for everything, you slime." And he does not hesitate to steal and to lie (even if he still claims "He despised this whole process of one lie after the other. It was all quite against what he believed in and stood for"). Everyone, from the President of the United States (whom he roundly ticks off!) to his own adored wife, seems ready to betray him. And, as for God, we are told that, “if God works in mysterious ways, he no longer wanted a god that worked this way.“ But right at the end, Jerry gets the bright if belated idea of telling all to the press, thus defeating the machinations of all the highest authorities in the land. It is a most extraordinary story, not least because the author, after describing the total corruption of all those set up an authority over him, also describes himself as “Proud Citizen of Canada and United States of America". You're left wondering what there is to be proud about. But the book was written at a time of considerable personal adversity and perhaps this should be remembered. 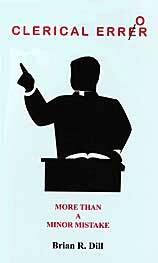 The cover of this self-published novel has a bold design - even if the content has nothing to do with preaching!